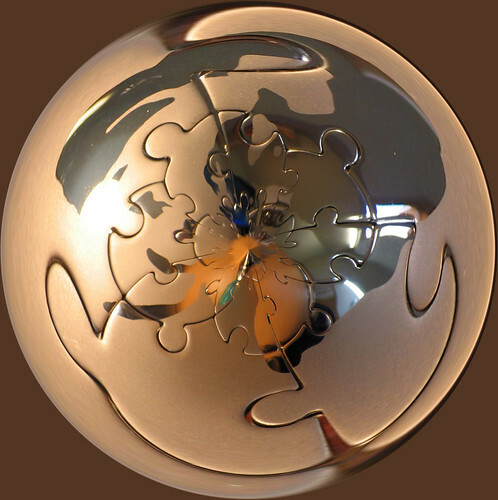 Amazing Global Square Puzzle!, originally uploaded by Natman. I was recently sent a few questions by a reporter working on a story about Wikipedia and its effect on higher education in Canada. He has kindly agreed to reproduce the raw, lightly-edited Q&A here. I do so in near certainty that my replies are missing key points or are altogether wrong-headed. And for the most part I avoided the epistemic thickets that Gardner cuts through with such grace. So feel free to catalogue my errors and oversights, the reporter will not be filing for another week or so, and I’ll make sure he knows about any meaningful response generated by this post. 1. What’s your take on students using Wikipedia as an academic tool? To your mind, what role can or should Wikipedia have on campus? Wikipedia has developed into a remarkably useful reference tool. Like most reference works, it does not represent comprehensive research in itself, but it can serve as a very effective starting point or quickly provide contextual information. I am not aware of any official UBC position or explicit policy, nor of discussions toward creating one. Nor am I aware of any other university creating such a policy. In my own personal opinion it would not be appropriate for a university to issue campus-wide directives on which research materials are permitted or how they may be used in courses. Such decisions rest with instructors, who make those determinations based on their own convictions, the standards of their departments and the practices of their disciplines. Deciding whether a piece of information is useful or not is rarely a simple determination. 3. Do you have any shining examples of the consequences of students citing Wikipedia, good or bad? First off, citing any encyclopedia for anything other than simple factual information is a sign of lazy research. Most reference works are best employed as starting points, or to provide background information to inform further investigation. Citing a constantly-evolving document that is open to abuse (as Wikipedia is) presents obvious dangers, which is why many instructors refuse to permit citations of Wikipedia. But one can always cite a specific revision of an article — Wikipedia provides a handy link for each entry that provides this information for citations. And it’s worth noting that Wikipedia has a remarkably dedicated community of editors who work very hard to ensure quality, and an open forum to discuss contentious points in a transparent fashion. Studies of Wikipedia have usually found that the overall accuracy of entries is roughly comparable to that of Britannica — and that Wikipedia is far more up-to-date and responsive to new developments. Keep in mind that a citation might serve a purpose other than providing evidence for a position. One might examine the edit history of a Wikipedia entry to trace the evolution of conventional wisdom on a subject, or to examine how consensus can be found concerning contentious subjects. Indeed, such research using Wikipedia’s content construction practice itself for data is becoming increasingly common. I’d say that Wikipedia is a powerful argument in itself that challenges a lot of our assumptions about how knowledge is constructed. Not only are Wikipedia editors willing to contribute their efforts for free, they do not expect tenure, glory, good grades or even attribution in return. 5. Do you think Wikipedia is or will be of historical importance? Are wikis a turning point in how people access information? Even if Wikipedia crashes and burns tomorrow, its prominence and the near-miraculous amount of useful content that it has assembled ensures it is of historic significance. Incidentally, the origins of the Oxford English Dictionary offer many striking parallels. Wikis (and it’s important to note that Wikipedia is a single and singular example of wiki) are one of many forms of online media that are challenging how knowledge is constructed, consumed, disseminated and assessed. 6. What about the role of peer review and academic tenure in the production and dissemination of knowledge? Don’t wikis undermine that? I don’t see how wikis or any other computer program can undermine academic practices such as peer review or tenure, unless those practices are somehow inadequate in themselves. Again, speaking solely for myself, I do believe that the emergence of new media does represent a challenge to traditional academic practice. But that challenge will not be met simply by resting on credentials and institutional reputation. We have a lot of smart people in our universities, and it is up to them to forge a set of practices that accommodate what is useful in emerging technologies while preserving the traditional methods and resources that remain relevant. The academy has always evolved to reflect the society it is part of, and that evolution must never end. 7. Does Wikipedia really encourage understanding, or is it just us scratching the itch of our habitual curiosity? Oh, a bit of both I suppose. When you see an incredibly detailed Wikipedia entry on the Klingon language it’s hard not to laugh and roll your eyes. But such cultural quirks should not obscure the genuine pragmatic value of the resource. Nor does it invalidate the super-cool nature of tens of thousands of volunteers working worldwide in good faith to create the best reference work possible. I fail to understand how any public-minded educator can’t be excited and encouraged by this phenomenon. Incidentally, I think that fostering a sense of “habitual curiosity” and tapping its energy is a noble and worthwhile mission, especially for educators. A tremendous piece of work here, Brian. I think it will receive wide readership and be cited for a long time to come. Your gift for humane clarity shines brightly, as does your enviable talent for resonant prose. If this piece were song and you were the singer, I’d say your phrasing was worthy of Sinatra. Even the implicit critiques are melodious. Gardner — you are too kind, but I’m grateful and humbled. Not sure why you call these ‘glib’ answers other than you’re just being your usual modest self-deprecating self. I’m kind of hoping these were your written responses to his questions because if you managed to be this eloquent and coherent speaking off the cuff I’d suspect you had a bunch of wikipedians feeding you answers through a hidden ear piece 😉 Great job! Dude — you know how I talk! I was a bit worried my tone was too stiff, but I was somewhat in a position of speaking on behalf of UBC (the request for an interview had initially gone to people far higher up in the hierarchy than me). Nice done, Brian. My only comment is that your statement…”Incidentally, the origins of the Oxford English Dictionary offer many striking parallels (to Wikipedia)”…begs for more! In what way? Can you provide an example or two? You wouldn’t think the Oxford was researched and written by average folk. By the way, it would seem that there are people who don’t seem to understand the whole wiki concept. I give you this example, which you mostly can’t access from outside of UBC, and it seems can’t edit even if inside. But Brian, I expect you to maintain a dignified silence on the matter. eTed, would it be shamefully circular reasoning if I pointed you to the Wikipedia history of the OED? …nothing short of a new and truly comprehensive dictionary would do: one that would be based on contributions from a large number of volunteer readers, who would read books, copy out passages illustrating various actual uses of words onto quotation slips, and mail them to the editor. If you don’t trust the source, there are ample references in the entry. Jon, as ever you overestimate my dignity and tact. It is indeed an odd implementation — if they don’t loosen up access a bit, one wonders why they use a wiki at all — (though if they pulled off CWL integration as it appears, I’m impressed). I suspect this will get better over time. It was Murray who really got the project off the ground and was able to tackle its true scale. Because he had many children, he chose not to use his house in the London suburb of Mill Hill as a workplace; a corrugated iron outbuilding, which he called the “Scriptorium”, lined with deal, was erected for him and his assistants. It was provided with 1,029 pigeon-holes and many bookshelves. Murray now tracked down and regathered the slips collected by Furnivall, but he found them inadequate because readers had focused on rare and interesting words: he had ten times more quotations for abusion than for abuse. He therefore issued a new appeal for readers, which was widely published in newspapers and distributed in bookshops and libraries. This time readers were specifically asked to report “as many quotations as you can for ordinary words” as well as all of those that seemed “rare, obsolete, old-fashioned, new, peculiar or used in a peculiar way.” Murray arranged for the Pennsylvanian philologist, Francis March, to manage the process in North America. Soon 1,000 slips per day were arriving at the Scriptorium, and by 1882 there were 3,500,000 of them. Murray’s granddaughter wrote a good biography, Caught in the Web of Words: James Murray and the Oxford English Dictionary (I couldn’t remember the title of this book from so long ago, but there it was at the end of Murray’s entry). There are some pictures of the Scriptorium in the book – what an amazing bit of work. Kevin — looks like we were thinking alike… I edited my comment to remove a duplicate quotation. Thanks! How come you failed to end the interview with “Suckas”? This is a script I will be carrying around with me for a while as a kind of bat utlity belt of intelligent responses. I like your style.